You’ve been accepted, received your visa, and packed your bags. But what should you expect from your first few weeks in college? Every college arranges a freshman orientation for its first-year students; one or a few days of events designed to welcome students to campus, help them settle in, and foster strong social bonds in the freshman class. Typically, the orientation consists of smaller group activities, through which students get to know their new classmates, the campus, and the area surrounding the college. Students are also assigned to a leader or mentor, an older student, who will help guide their group of students through their first weeks on campus. The week ends with the Matriculation ceremony, when you will officially join the college as a student! Most activities are not mandatory, but why would you pass up on a chance to make new connections, or potentially even the opportunity to enjoy some free food? International Orientation – What is it, and should I participate? Most colleges arrange orientation programs that are specifically designed for international students. These are typically scheduled before normal freshman orientation begins. You’ll learn more about living on a college campus as a foreign student, regulations around the student visa, and – most importantly – have the opportunity to make friends from around the world! International orientation programs are a great way for students to be introduced to the campus and become a part of the tight-knit student community already during their first days. Participating in International Orientation will NOT restrict your social circle; you will still have plenty of opportunities to make American friends. Plus, at many colleges, American students (including US dual citizens) are actually one of the largest national groups that participate in these programs! 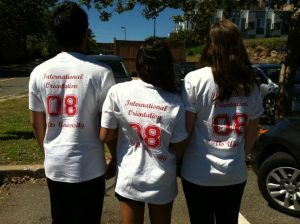 International Orientation is really just meant for students with a global outlook. As a transfer student myself, I participated in international orientation programs twice: once as a freshman at a larger state school, where the program was a one-day course on the student visa immigration status, and once as a transfer student at a medium-sized private college, where the program was filled with activities and ran for three full days. The experiences were very different, but both left very strong marks on me; I would even go as far as to say that they defined my college experience. Being a freshman at a large university, the program was a way for me to find a social circle on the otherwise overwhelmingly large campus. As a transfer student, I had felt nervous about making friends, but was relieved to find a welcoming and like-minded community in my international orientation group. And it didn’t stop there; I met all my closest friends during my participation and involvement in the program, and actually loved my experience so much that I returned to the program as a peer leader, program coordinator, and alumni support staff and interviewer. Not interested in International Orientation? Then look for other pre-orientation programs that interest you! Many colleges offer specialized options, such as programs focused on outdoor activities, fitness, mindfulness, or community service. NOTE: Transfer students have their own orientation program, but the activities and events tend to be similar to the freshman orientation program. Participate in the programs and events that suit you best – your first weeks in college are the best time to explore and make new friends!